The section of the mandrel assembly which connects the mandrel sub-assembly to the mandrel rod of a tube-bending machine. In an inserted mandrel assembly, the mandrel body does not include a nose, which is a separate detachable component held to the body by means of the insert link and the mandrel screw. Therefore, the mandrel body in this case is a relatively long-lived component that needs to be replaced only after extreme wear. 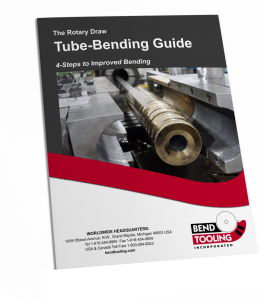 The mandrel body of a non-inserted mandrel assembly has an integrated nose to control the flow of material at the point of bend. Thus, such a mandrel body wears out when the nose does and is relatively short-lived compared to that of an inserted assembly. Because a mandrel body cannot be reconditioned for re-use in the same tube-bending application (it is occasionally possible to re-machine it for another application), it must be discarded after its nose wears out. This is its primary disadvantage. However, a non-inserted mandrel body remains the tool of choice for those applications with a high rigidity factor (for example, non-round tubing or compression-resistant materials like Inconel) because its strength is a more important consideration than tool life. Technically a mandrel body is not a plug. A plug is a complete, fully-functioning mandrel assembly, whereas, a mandrel body is a component of a mandrel assembly (although in the case of a non-inserted plug, the mandrel body is the only component of that assembly).